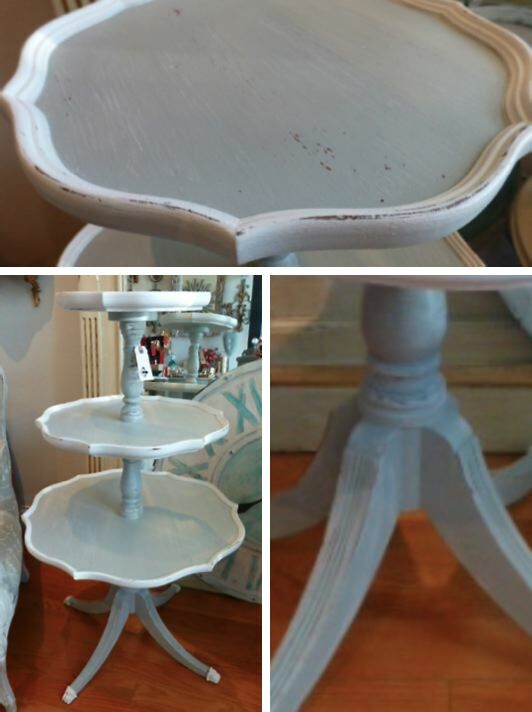 Fabulous solid wood 3-tier antique table with beautifully scalloped pie-crust edging, perfect for display. Highly distressed painted finish in gray with white detailing. Measures 38" tall, the top is 12" in diameter, middle is 17" in diameter and the bottom is 23" in diameter. Please only buy this if you adore antique and vintage furniture, our items are all in good condition but because they are antiques they will shows signs of wear. If there are any serious issues we will point them out. The vintage patina to the paint is considered a desirable feature! This piece has been thoroughly inspected and is in excellent condition with only normal signs of age and use. Please contact us regarding shipping arrangements.